The primary goal of PCDS athletics is to ensure that each child has the opportunity to grow as an athlete and human being— the values of teamwork, persistence, commitment, selflessness, humility, and self-confidence are critical to any great athletics program, and are the core of our PCDS athletic offerings. PCDS Varsity Boys’ Soccer won the 2017 2A State Championship in thrilling fashion this year. The Eagles trailed early in the game and went down a man late in the second half but were soon able to net a goal from Ryan Horlick. The match went scoreless through overtime periods, and would be decided by penalty kicks. The Eagles went down early in the shootout after missing their second shot, but keeper Ty Rodin brought the team back on two key saves, capped by the game winning kick by senior Jake Sarver. 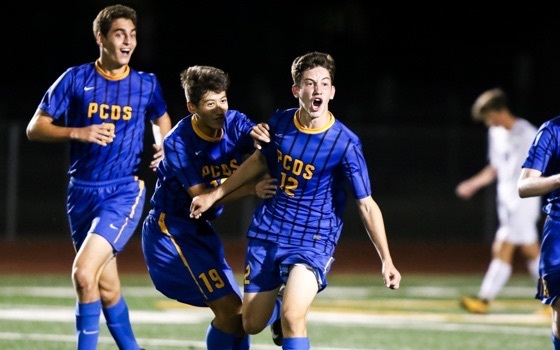 The team, coached by PCDS Head of School Andy Rodin, was seeded #4 in the tournament, but went on an incredible run, defeating both the four-time reigning state champions in the semi-finals, and the #2 seed in the championship. “This team was resilient and showed grit, despite challenges and missteps,” said Coach (and PCDS Head of School) Andrew Rodin. “I’m incredibly proud of their hard work all season.” “This is the School’s ninth varsity state championship in the last ten years,” said Athletic Director Shane Lewis. “PCDS is a place where kids can get a top-notch education, as well as excel at the highest levels of their sport.” Congratulations to the student-athletes and coaches for a wonderful season! Many recent NCAA-bound graduates were multi-sport athletes at PCDS. And, at times, especially talented student-athletes have been recruited to play multiple sports in college. Margaret Loncki ’14, for example, played both soccer and golf at Claremont McKenna College. And, some students have fully-dedicated themselves to their single sport, balancing both PCDS varsity experiences and year-round work on club teams or offseason workouts in order to improve. Andrew Ekmark ’16 was often found in the gym lifting weights and shooting hoops with his coaches en route to his commitment to play basketball at Stanford. While opportunities abound for these student-athletes in their respective sports in college, their academic preparation has also helped open doors at some of the most selective colleges in the country. In just the last two years, PCDS has college athletes playing at Pomona, Gonzaga, Emory, Brown, Colorado College, Williams, Claremont McKenna College, Stanford, Tufts, and Carleton. From the soccer pitch to the basketball court to the baseball field— that was Ty Rodin’s experience throughout Middle School athletics. A jack-of-all trades athlete, he loved the competition and teamwork skills he developed alongside his friends. 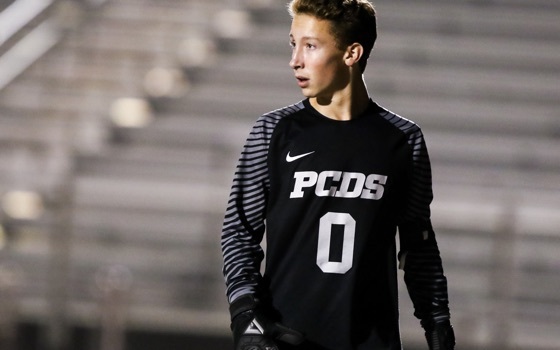 As one of the 85% of Middle School students to participate in PCDS athletics, and the 75% of Middle School students to participate in multiple sports throughout the year, Ty’s learning extended well beyond the classroom during his formative years.